Ankle pain that results from traumatic injury is often thought of as sports injuries. 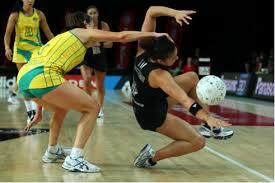 But you don’t necessarily have to be an athlete or even a social sportsperson to twist your ankle. Something as simple as walking on an uneven footpath can cause a rolled ankle, resulting in ankle sprain. Ankle injuries can potentially occur at any age. Thousands of people sprain their ankle everyday around the world. Just while you’ve been reading this article a few hundred people have sprained their ankle. Over 90% of ankle sprains are injuries to the Anterior Talo-fibular Ligament (ATFL for short). This is due to an inversion injury, where the ankle is twisted inwards. 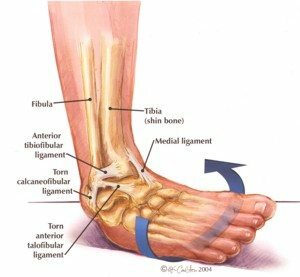 There are three major ligaments on the outside of the ankle – the ATFL, the Calcaneofibular ligament and the Posterior Talo-fibular Ligament. 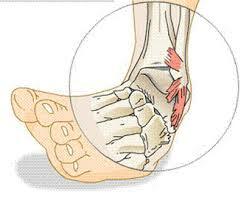 Generally, the worse the injury, the more of these ligaments are damaged. We use the term “sprain” to describe an injury of a ligament (remember a ligament connects a bone to another bone). Sometimes the ankle can twist outwards, injuring the ligament on the inside of the ankle. This guide will focus on lateral ligament sprains, but the same rules generally apply. What should you do about an ankle injury? Ice and compression as soon as possible will give you the best possible start to recover as quickly as possible. Try to keep the ankle in a neutral position. Get your ankle assessed to ensure there is no serious damage. Accurate diagnosis will put you on the right path from the beginning. Start weight bearing as soon as you are comfortable to do so. Even partial weight bearing with crutches is better than no weight bearing. 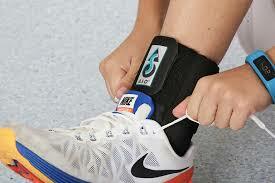 Use tape or a brace if you need to reduce pain and stabilise your ankle. Keep the ankle moving. Normal movement will encourage good healing and get you back to activity quicker. Functional rehabilitation is the best approach to complete recovery. Ensure that you complete your rehabilitation to avoid persistent problems. Most people should not have to put up with ongoing ankle issues – as long as the do the right thing. At the Foot and Ankle Clinic our highly qualified team of Podiatrists are all members of the Australian Podiatry Association and offer a combined 50 years’ experience. They are trained to diagnose and effectively treat ankle injuries and sprains via a range of treatments.